We made the most adorable box at our group meeting last week! 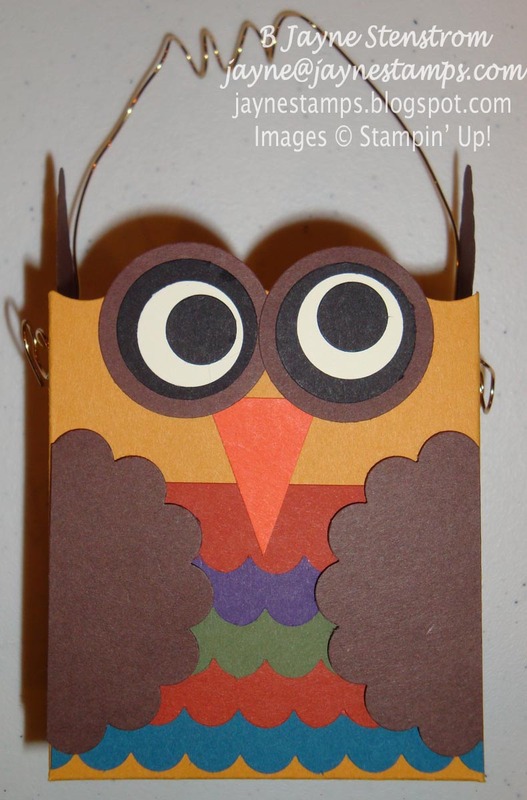 I found a pattern for this Owl Fancy Favor Box on Stetler Arts Blog. It was just so cute, I couldn't resist making it. Everyone at the meeting liked theirs too! You can get the actual instructions HERE, but I'll give you a list of the basic supplies we used. The base is More Mustard cardstock cut with the Fancy Favor Die. 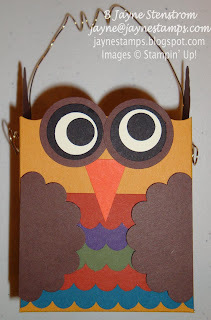 Other cardstock colors used were Cajun Craze, Almost Artichoke, Elegant Eggplant, Not Quite Navy, Basic Black, Whisper White, Chocolate Chip, and Tangerine Tango (for the beak). We also used the Scallop Edge Border punch, Petite Pennants Builder Punch, 2-3/8" Scallop Circle Punch, 1-1/4" Circle Punch, 1" Circle Punch, 3/4" Circle Punch, and 1/2" Circle Punch. The wire is retired from Stampin' Up!, but you could use any kind of wire as a handle. I also thought I would show you that Webster has decided he is our semi-official "mascot". 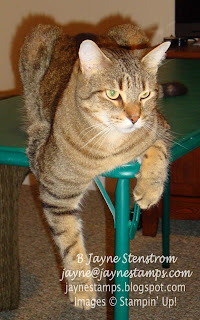 He comes down when the ladies are here for a meeting or stamping class and makes himself comfortable - wherever. (This was supposed to be our table for snacks!) Goofy cat!